6 quart utility pail. 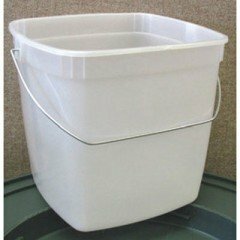 Utility pail for general purpose cleaning and other uses. Made of high density polypropylene with metal handle. Embossed graduations for easy measurement. Fits more conveniently in janitor's cart; square design. Measures 9" width by 7-1/2" height by 7" depth. Translucent color.